Project DISHA, designed and developed by Learnnovators, is the world's first chatbot-powered eLearning course in Articulate Storyline. This article will give a behind the scenes glimpse of what went into the making of Project DISHA. Workplace sexual harassment continues to be one of the most under-reported crimes in India and the world over. A primary reason for this is the lack of awareness, both by ‘victims’ as well as ‘perpetrators’, on what constitutes sexual harassment, and the action to be taken when faced with it. Project Disha is here to help. 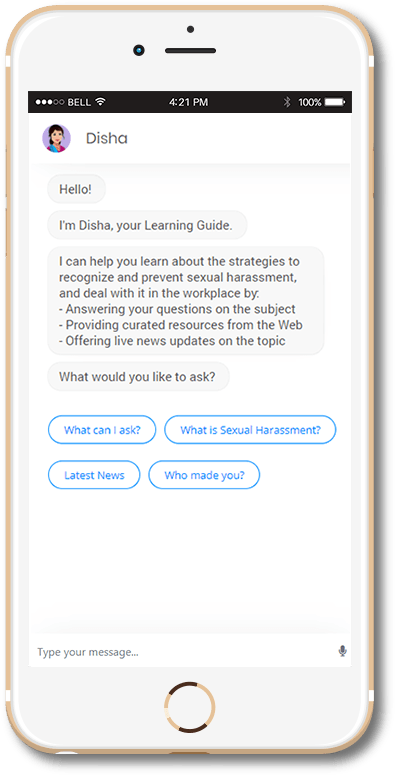 This project consists of an Artificial Intelligence (AI) enabled chatbot at its core, which sits on top of an eLearning course on ‘Prevention of Sexual Harassment’, and answers learner questions and alleviates concerns on the topic. 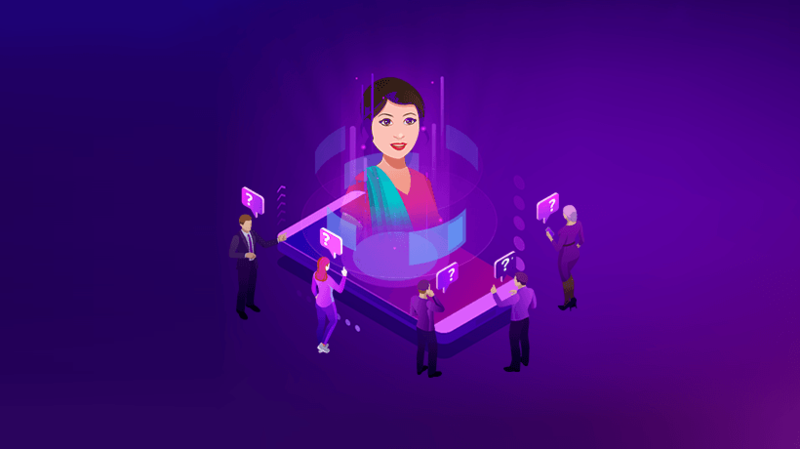 This chatbot, called Disha the Learning Guide, also helps learners freely navigate the content without any restrictions and is the world's first chatbot powering a course developed in Articulate Storyline. The eLearning course addresses the issue of awareness via well-designed scenarios that deliver key messages. 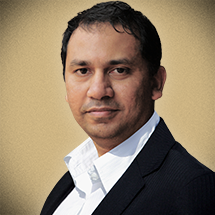 Let’s go behind the scenes and take a look at what Project Disha is made of. 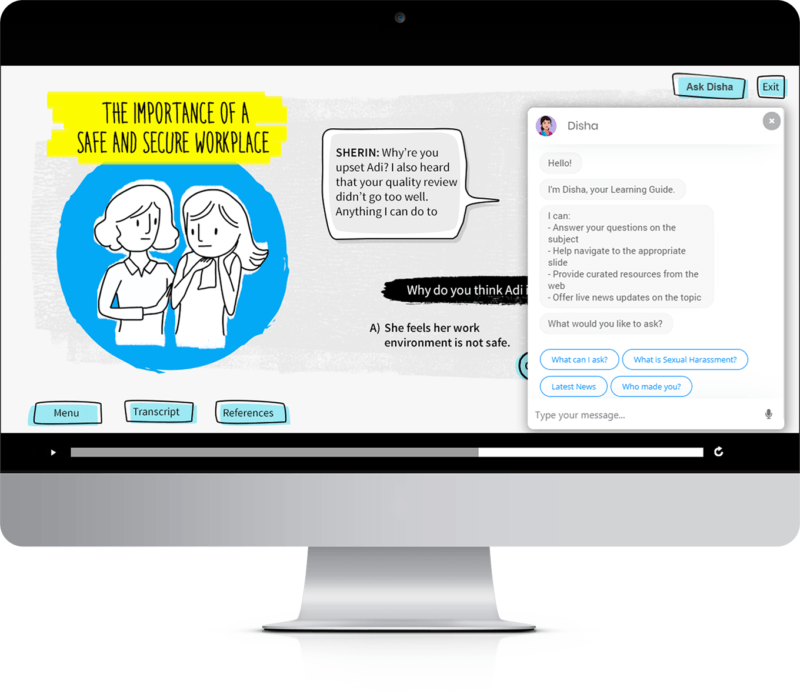 This is highly interactive and scenario-driven and offers strategies to recognize and prevent sexual harassment and deal with it in the workplace. It draws on the provisions of the Sexual Harassment of Women at Workplace Act of 2013,  and by virtue of doing so, is aimed primarily at the Indian market. The course contains four modules, each one presented through a series of scenarios, designed to help learners understand sexual harassment in the context of real-life situations. Within the course, Disha answers questions related to sexual harassment and ways to prevent it. Using smart suggestion boxes, it guides new learners even in asking questions, thereby ensuring that they don’t feel lost by the open nature of a chat conversation. It also helps learners learn the subject on their own without being restricted to the course’s navigational structure. Disha is also available outside the course, wherein it can be accessed on the web or via a mobile phone. Here, it acts as a quick reference, helping learners refer the content after completing the course, by providing answers to quick queries, thereby saving them the trouble of logging into the course all over again for minor clarifications. Here too, it uses smart suggestion boxes to guide learners who may feel lost in the format of an open conversation. What Can Disha The Learning Guide Do? Answer questions on workplace sexual harassment. Help navigate to the part of the course relevant to the topic when accessed from within the course. Point to the best-curated resources available on the web on the subject. Offer live news updates on the subject. What Questions Can You Ask Disha? I’m being harassed. How do I deal with it? Are there any interesting videos on this topic? What is the latest news on this? This complaining, does it really work? Any examples of powerful people who were brought down because of a complaint? What kind of questions can I ask you? Artificial Intelligence (AI). Aside from being the latest bandwagon in town, AI has real power, when used well, to transform learning. While the scope of AI is vast and its technicalities mind-boggling, Disha is our little initiative to use its potential to enable conversational learning via a chat interface. Make Project Disha available in other regional Indian languages. Work further on the design of the chatbot to make learning and performance support more natural and impactful. Sexual harassment is a sensitive topic. For a person going through such a harrowing experience, it can mean the world to have someone to fall back on and to provide direction and guidance. Well, Disha cannot replace a real human to offer support in such cases. But it can come close, by providing inputs and pointing them in the right direction. What’s more, it can do so without judgement. This is also why we have made two versions of Disha; one that sits inside the course, and one that’s available outside. So that it can be accessed quickly, from anywhere, and on the move. Chatbots can help make learning ‘conversational’. This dialogue-based approach syncs with our natural form of communication and learning and ensures a better learning experience for users since the guidance they receive could give them a feel of personalization. In short, these Virtual Agents help ‘humanize’ learning. Chatbots could be helpful where we may want to offer a limited/lighter version of the course content to another audience (such as another department or the general public) in an easier to consume format. Such learning solutions could also be launched for a world-wide audience through channels such as Google Assistant or Apple Siri. Chatbots are excellent mediums to deliver performance support solutions to users in manufacturing settings since these agents can deliver the ‘right content’ (content in need) at the ‘right moment’ (moment of need) through the users’ own headsets connected to their smartphones or tablets, offering them hands-free assistance in the workflow. Chatbots can be leveraged to support learners with additional/updated content to improve their efficiency at work (contextual guidance required to help users get the job done). They can also be used to provide dynamic (live/on-the-fly) content support to learners without the need for Instructional Designers to go through the effort of updating the eLearning courses. These could be particularly useful in situations where the content needs unexpected updates for users in complex workplace situations. Chatbots can act as great mediums for Instructional Designers to capture learner feedback on their experience. They can also act as channels for inviting learners to share their learnings from their prior work experiences. We look forward to seeing the development of these and many more ideas in the use of chatbots for learning. So much so that we might come to the point of saying “There’s a chatbot for that” 😊. What are your thoughts and experiences designing chatbots for learning programs? Project Disha is aimed primarily at the Indian market. Organizations in India that wish to educate their employees on sexual harassment, and to remain compliant with government regulation, would benefit greatly from this.